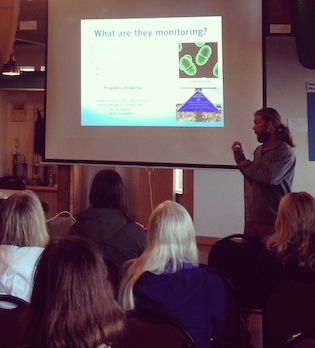 Surfrider and the Oregon Department of Environmental Quality (DEQ) just hosted a beach bacteria workshop in Newport, Oregon to inform the public of their joint efforts to asses beach water quality impairments and support the DEQ's Midcoast Water Quality Management Process. Thanks to the generosity of Eva Chiles Meyer Fund #1 and the Oneatta Fund of the Oregon Community Foundation, Surfrider will be expanding our work at the community level this year, and this workshop was a great opportunity to bring together our dedicated volunteers and community partners to discuss the opportunities we have to advance conservation strategies and pollution solutions for water quality issues along the Oregon coastline. For over ten years Surfrider volunteers along the central coast of Oregon have been taking samples and continuously raising funds for their ongoing BWTF water quality testing program. These efforts have not only provided important information to recreational users, the local communities and visitors, but also help inform management plans required by the EPA to address beaches with chronic bacteria problems. This workshop brought together local knowledge and shared data from the Newport and Siuslaw Chapter’s BWTF program and Oregon’s Beach Monitoring Program and presented DEQ’s online mapping tool to support integrating these partner efforts. Surfrider’s Oregon Policy Manager, Charlie Plybon, kicked off the workshop by presenting some of the historical efforts of beach monitoring on the Oregon coast and the importance of supporting ongoing funding for state beach monitoring programs. Staff from both the State DEQ and the City of Newport’s Department of Public Works discussed efforts to improve and protect water quality and beneficial uses throughout the Mid-Coast Basin and within Newport specifically. This workshop was a great opportunity to bring together local knowledge and shared data from both Surfrider's volunteer water testing program and the agency-run program to discuss how these partnerships can help inform and direct management plans to solve beach pollution problems. Now that’s citizen science and agency collaboration at it’s finest! More details on this bacteria workshop can be found here.